This is a picture of guttate (drop-shaped) psoriasis on the arms and chest. 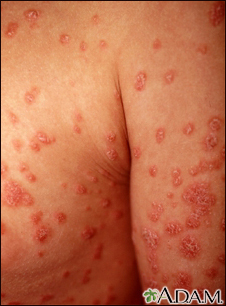 Guttate psoriasis is a rare form of psoriasis. It frequently follows a streptococcal infection, appears rapidly and affects the face, chest, and nearest limbs. The patches are small and round or oval and have the typical appearance of psoriasis. This photograph shows the diffuse and widespread coverage on the arm and chest.